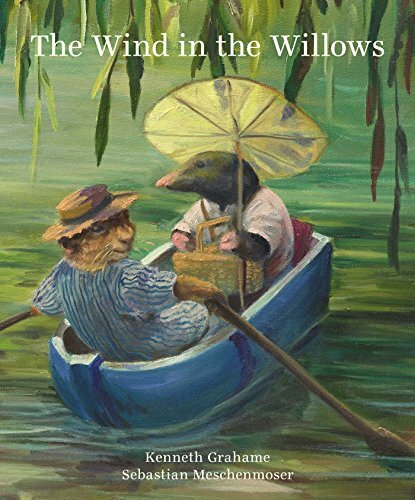 The Wind in the Willows has been enchanting readers both young and old since it was first published in 1908. It has never been out of print, and in the century since the book was first published, scores of artists have illustrated editions. Among the most notable are Paul Bransom (1913); Nancy Barnhart (1922); Wyndham Payne (1927); E. H. Shepard (1931); Arthur Rackham (1940); Tasha Tudor (1966); and Michael Hague (1980). This latest edition is a beautiful volume illustrated by the award-winning German artist Sebastian Meschenmoser. Considered one of Germany's most successful and admired young illustrators for children, Meschenmoser lives up to his reputation with these beautifully drawn and soft, watercolor-tinted images. In Meschenmoser’s paintings, we know and understand the personality and present mood of each animal. When Toad, Ratty, and Mole set out in the gypsy caravan, “shining with newness, painted a canary-yellow picked out with green, and red wheels,” Meschenmoser captures each member of the trio beautifully. Toad is puffed up, proud and cocky. Poor Ratty, full of misgivings, stands with a despairing look in his eye and a down-turned mouth. Mole, who was, “tremendously interested and excited” about the caravan, has wide, eager eyes and an open smile as he claps his paws together in happy glee. A chapter later, “Toad found himself immured in a dank and noisome dungeon, and knew that all the grim darkness of a medieval fortress lay between him and the outer world of sunshine and well-metaled high roads where he had lately been so happy . . . he flung himself at full length on the floor, and shed bitter tears and abandoned himself to dark despair.” Meschenmoser depicts him lying on a straw-strewn stone floor, reclining on the huge ball of the ball-and-chain that restrains him, weeping piteously. He asks his friend Ratty to make the introduction, but the Water Rat is uncomfortable asking Badger to dinner or paying him an unannounced visit. Finally, in the depths of winter Mole decides go by himself. Meschenmoser captures Mole’s rising panic, depicting the wide eyed little figure walking between two bare, snow-covered trees that, in the dim light, look like dragons rearing up to swallow Mole whole. The best illustrations in the book are the small watercolors set into the text. They are beautifully drawn and delicately tinted. Less successful are the full-page and double page spreads. In them, Meschenmoser’s depiction of the characters and their environs is crude, executed with broad brush strokes and a dark, often muddy, color palette. These illustrations seem at odds with the gentle, detailed images that enhance the rest of the book, and in several cases the larger paintings are rendered in styles inconsistent with each other. The impression is that the artist tired of one look and decided to experiment with others. Despite the jarring, incongruous change of style in the larger illustrations, overall this is a beautiful book that is worthy of a place in any child’s—or adult’s—library of treasured stories.